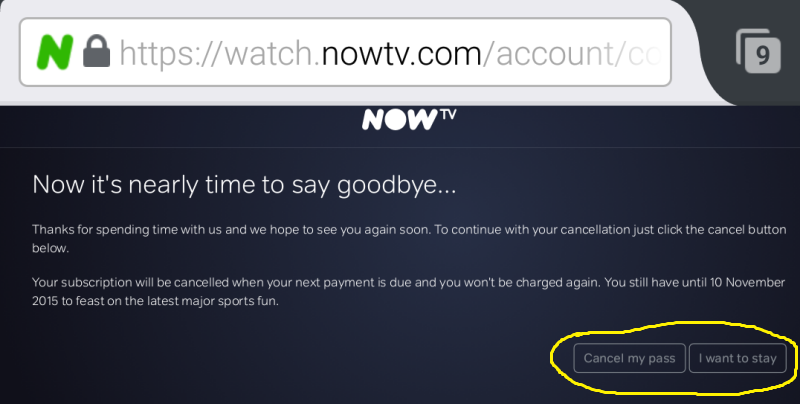 How hard can one company make it to cancel a subscription? 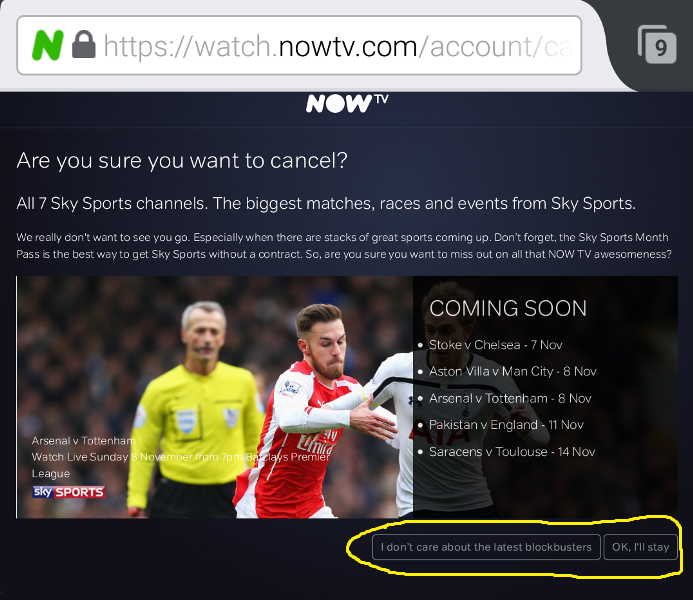 Sky TV in the U.K. is surely up there. 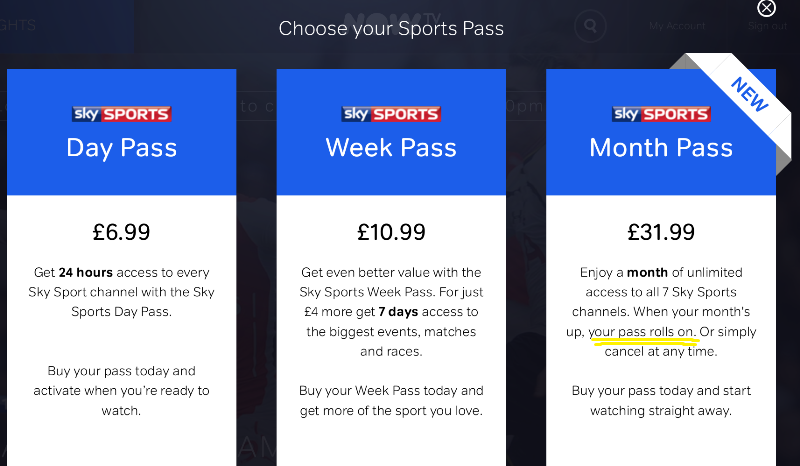 I’ve used its short-term NOW TV service for a while to access Sky Sports — a weekly pass, costing £11, is a bargain considering there is no obligation to continue using the service once the pass has expired. However, with a big sporting agenda coming up, I invested in a £32 monthly pass instead, and did not regret it. However, when electing to buy a monthly pass, I totally assumed the T&Cs would be the same as the weekly pass, so I just hit the “Buy One Month” button, and was happy. But if you look closely, the monthly pass continues to roll-on by default, a fact that will likely be missed by many people accustomed to the long-established weekly pass. By chance, I just happened to notice this when I looked at my account to check how many days I had remaining on the monthly pass. Had I not done that, the pass would have automatically rolled over and a further £32 would have been debited from my bank account. Was this a case of “my bad” for not noticing this in the first instance? Perhaps. But I can’t help but think any service that’s sold as a short-term offering (e.g. 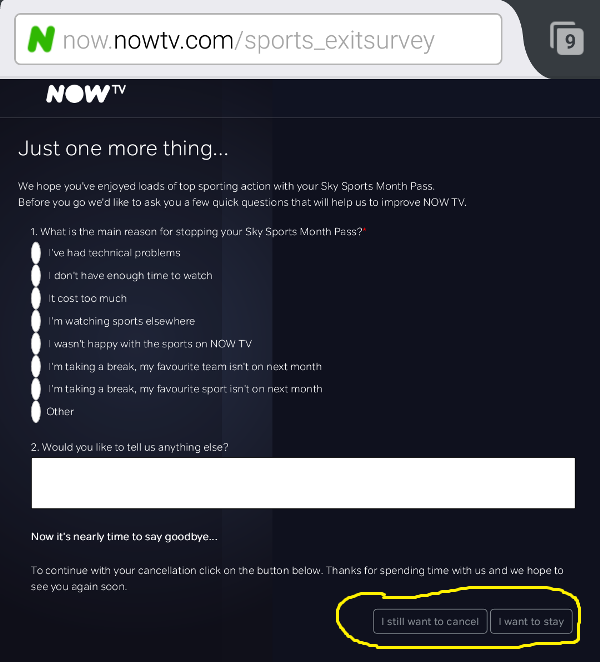 “one month”) shouldn’t automatically opt you in to continue. By all means offer a recurring option, it’s something that many people will no doubt want, but it should be on an opt-in basis. 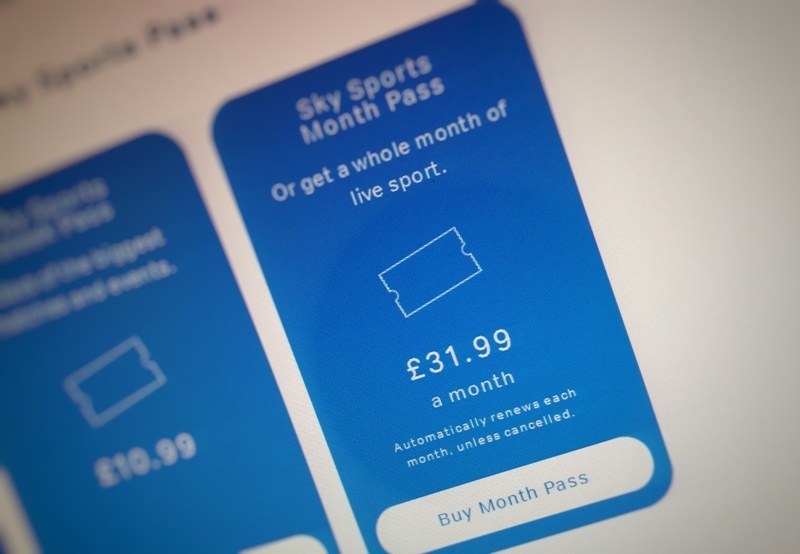 Furthermore, Sky makes it ridiculously long-winded to stop the monthly pass from recurring. In your account, there is a list of passes that are currently active (Movies, Entertainment, and Sport). Hit the “Cancel Pass” option. Rather than this cancelling your pass, you’re given a list of upcoming events to entice you to keep the pass running. Now, hit the “I don’t care about the latest blockbusters” button (even though this isn’t movies I was cancelling, but I digress). Is that it? Nope. Many people likely wouldn’t bother reading the blurb on the page that comes next, assuming that it’s some sort of “sorry to see you go” text. After all, surely Sky wouldn’t require you to hit yet another buton? Two cancellation stages was probably about correct here. Three is overkill, and four is a joke. 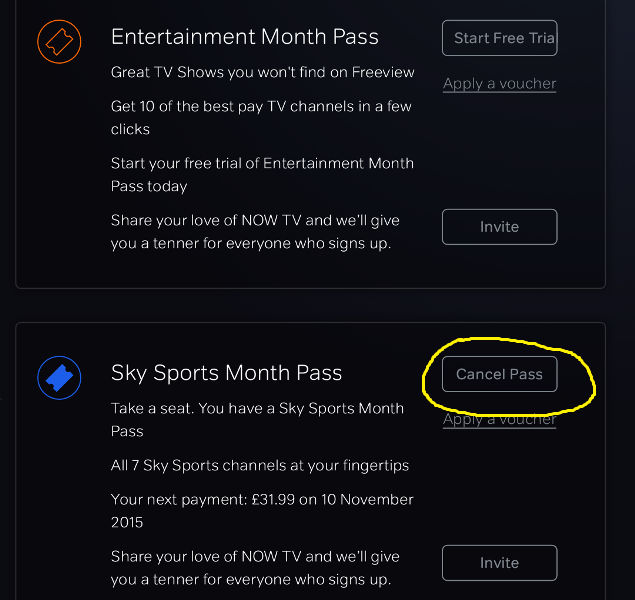 The only reason I can think of that Sky would wish to put this final cancellation stage in, is to trick users into accidentally keeping their pass going. The final stage is totally, and utterly redundent to the entire process.